I purchased the custom knife blade from Julius Pettersson last Christmas, and on receiving it was very pleased with the quality of the blade; I found that it was the perfect design for carving, splitting small logs and everything bushcraft. I had seen that the handles of most half-tang knives on the market were practically all made of wood, so I decided to make a knife slightly different to the usual design. I bought the book Antler Knife, and decided to mix the two designs a bit. I used two blocks of masur birch, a block of oak burl, some reindeer antler I purchased and leather as the dividers. 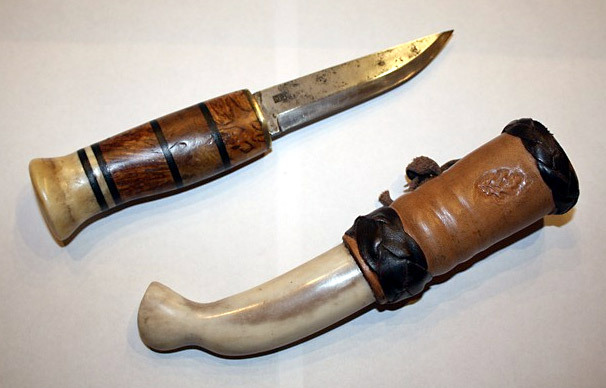 The ferrule was made out of brass, and I found this to give the knife extra strength when riveting the tang at the end piece of the antler pommel. I used polyurethane glue to stick it all together, using a homemade jig, and have found this to be a more than sufficient way of securing the separate blocks. I made the handle into the shape of my hand, and I have found that this knife handle would benefit from a thicker set handle. I finally finished off the handle with a file and some very fine sandpaper, with a touch of linseed oil to bring out the grain. The bottom half of the sheath was an L-shaped reindeer antler block I had purchased from Woodlore, and the top half was a piece of leather that I had stamped with one of my favourite logos. The pieces of antler I glued together with Araldite, and the leather section was stitched together with an awl, some waxed linen thread, and a lot of elbow grease! My final product was a knife that not only looked nice, but that I could trust to use; I would highly recommend the hand-made blade from Woodlore, as for me anyway, it is of great design and quality. I will hopefully be making some more knives in future, so I will try and keep you posted. This entry was posted in Bushcraft Clothing & Equipment, Customer Posts on February 8, 2011 by Woodlore Team. Hi Hywel, superb craftsmanship, I just received a Julius Pattersson knife today, have no idea on how to start the handle and sheath, but you have given me inspiration. Thanks. Very beautiful knife bud! Fantastic! Awesome!!! I still use the Wilkinson Sword bushcraft knife while I wait for the Alan Wood original. However, I am now inspired to “have a go” at making my own. Fantastic work.